You may be tired of scraping the frost off your windshield in the morning and perhaps you grumbled while shoveling snow from your sidewalk last week (we had 3″ on 2/20/19 at Dyck Arboretum). But don’t believe Punxsutawney Phil when he predicts six more weeks of winter or become dismayed by this year’s colder spring or higher number of cloudy days than usual. Warmer weather is coming and there are harbingers of spring out there if you pay attention. 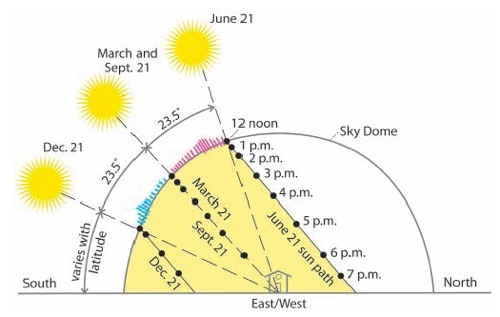 We are gaining roughly two minutes of sunlight every day since the December 21 solstice. The weather may have been unpredictable and cloud cover variable the last couple of months, but we can rely on the daily incremental increase of daylight like clockwork as the sun gets higher in the sky. More light means more warmth and plants/animals respond to these changes in photoperiod. Changes in bird behavior help mark the changing of the seasons. Bird songs seem to be more prevalent in the morning recently. I heard House Finches and Northern Cardinals here at the Arboretum both singing on a morning last week (2/20/19). I would suspect that means something with regard to territory and mating. The courtship ritual of the American Woodcock is a sign of spring around dusk to twilight in early- to mid-March. Hearing their nasal “peent” while faintly seeing them circle skyward before tumbling to the ground is an interesting and memorable experience. Harris’s Sparrows and Dark-eyed Juncos for me are signs of winter and their migration north signals spring. 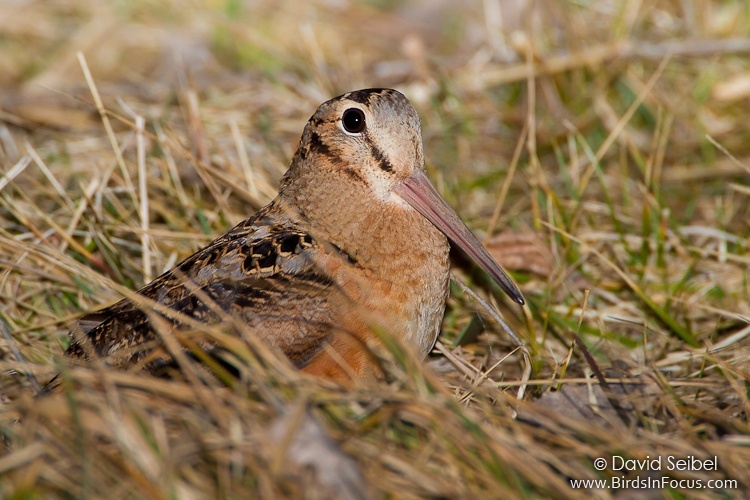 They are still around here in late February, but their numbers are dwindling and their presence will soon be scarce. 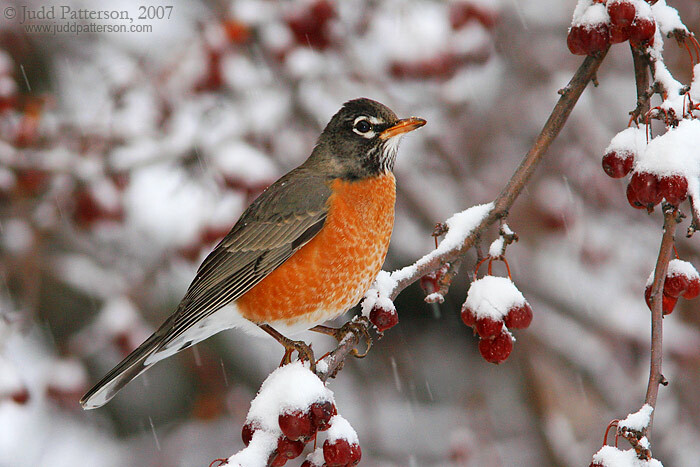 American Robins do overwinter here, but their behavior of eating fruit will soon turn to poking around in the soil for food as soil temperature and earthworm activity increases. One can track the spring movements of wildlife, and particularly Robins, including those sighted, getting earthworms, nesting and moving in waves at Journey North. To become more in tune with birds around you, learn more about common to rare birds, their migration patterns, behaviors, songs, food preferences and more, consider joining Kansas Ornithological Society. Be sure to sign up for emails from their Kansas Bird Listserv through which you will get regular reports from experienced birders around the state. And if you ever wonder what migrating birds are doing when they are not in Kansas, check out this very cool story about the migration of Grasshopper Sparrows and Upland Sandpipers. On warm days I look forward to seeing insects beginning to fly and move about. That means host plants and flowers are coming out or will soon be found as well. The presence of insects as food means that birds, reptiles, amphibians, mammals, fish and predatory insects will have something to eat. Insects are an important basis for the food chain of wildlife around us. But perhaps the most recognizable and celebrated insect out there is the monarch butterfly. 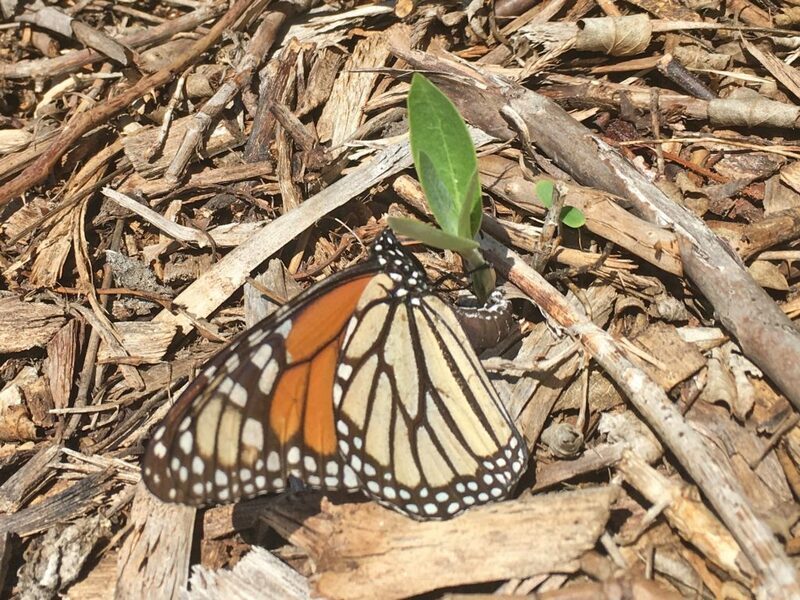 Journey North again is a good place to track monarch movements as well as the emergence of their ever-important host plant, milkweed and when/where monarchs are laying eggs on milkweed. The first monarch adults were observed along the Gulf Coast this weekend (2/23 and 2/24) and I expect that we will start seeing our first monarchs in Kansas by early April. Monarch ovipositing on common milkweed at Dyck Arboretum, April 10, 2017. Then, there are the emerging plants. The first I know to bloom here at Dyck Arboretum every year is witch hazel. As the warm sun came out one afternoon last week (2/20/19) and above-freezing temperatures melted that morning’s snow, this early-blooming shrub burst with flowers. 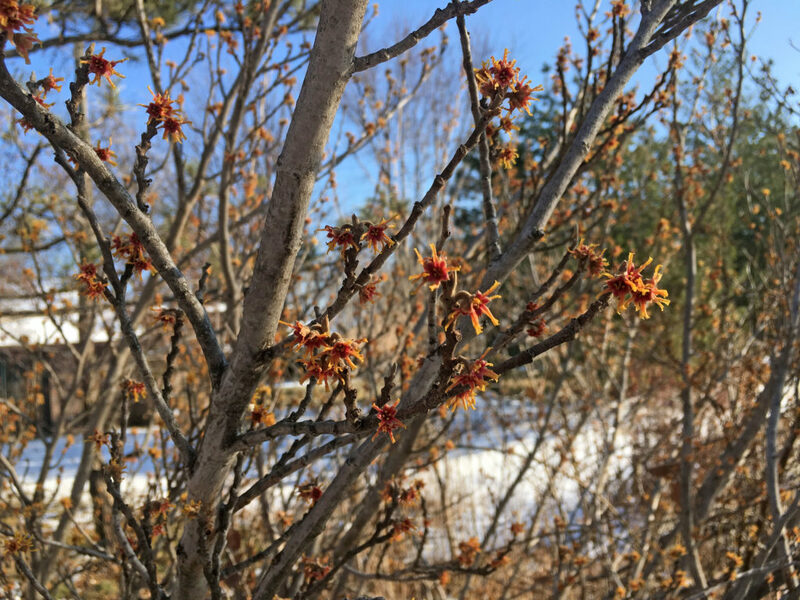 Hamamelis vernalis – vernal or Ozark witch hazel, Feb. 20 at Dyck Arboretum of the Plains. 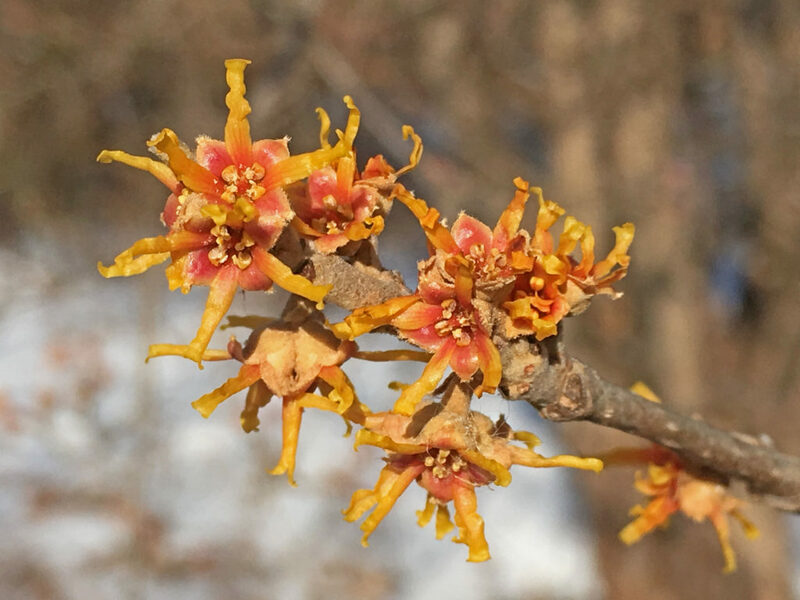 As its two common names suggest, vernal or Ozark witch hazel (Hamamelis vernalis) is a spring-blooming shrub that originates from the Ozarks of southern Missouri. You have to look closely because vernal witch hazel is not an extravagant bloomer. 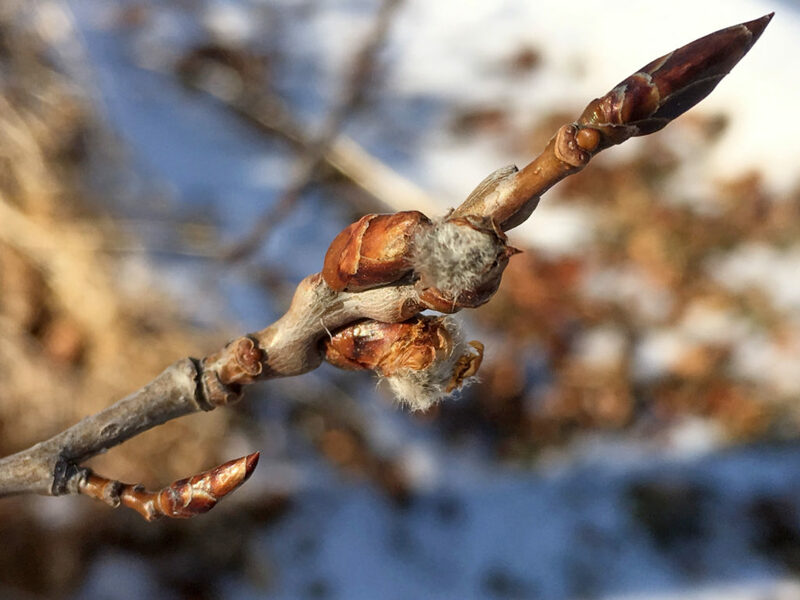 During warm winters, vernal witch hazel starts blooming here at the Arboretum as early as mid-January and during cold winters as late as early March. Over the last few cold weeks of February, I’ve watched seemingly struggling flowers wait partially open for their time to shine. And last week this harbinger of spring did not disappoint. 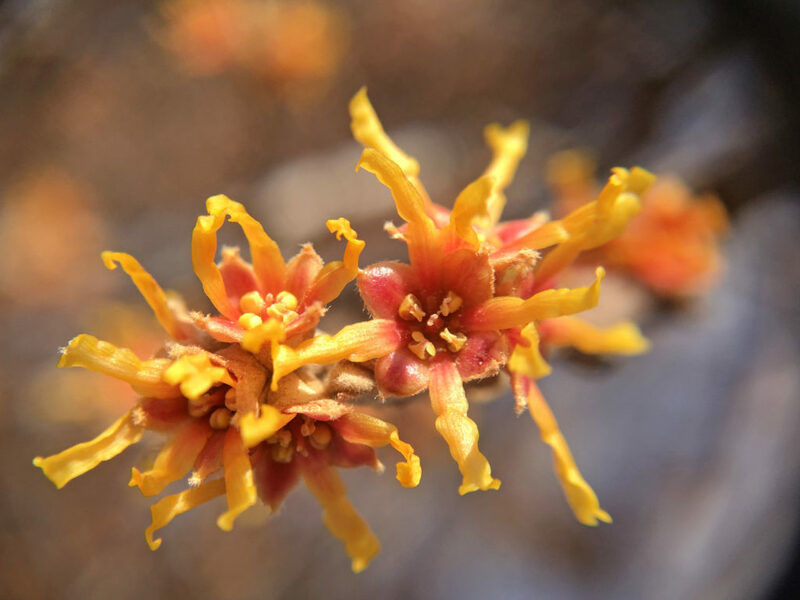 On warmer days to come, flies and bees will be attracted to the nectar of these tiny, dime-sized vernal witch hazel flowers. The flowers of Prairie Gold® aspen (Populus tremuloides) ‘NE Arb’ are starting to emerge outside the doors of our Visitor Center. Soon the fuzzy catkins of this fast-growing tree with origins in Nebraska will emerge so the wind can disperse its pollen. (Populus tremuloides) ‘NE Arb’ fuzzy catkins emerging Feb. 22, 2019. And finally, the common urban tree, silver maple (Acer saccharinum), is one of the spring harbinger flowers you will probably not see, but many of us will know when it starts blooming. The airborne pollen of these not very showy wind-pollinated flowers will soon fill the air and activate itchy and watery eyes and noses (Click HERE if you want to delve a bit more into the differences between wind- and insect-pollinated flowers). I have learned that these unappealing sensations caused by wind-pollinated maples and elms early in spring are harbingers too. Locate your anti-histamine medications and roll out a welcome for spring. 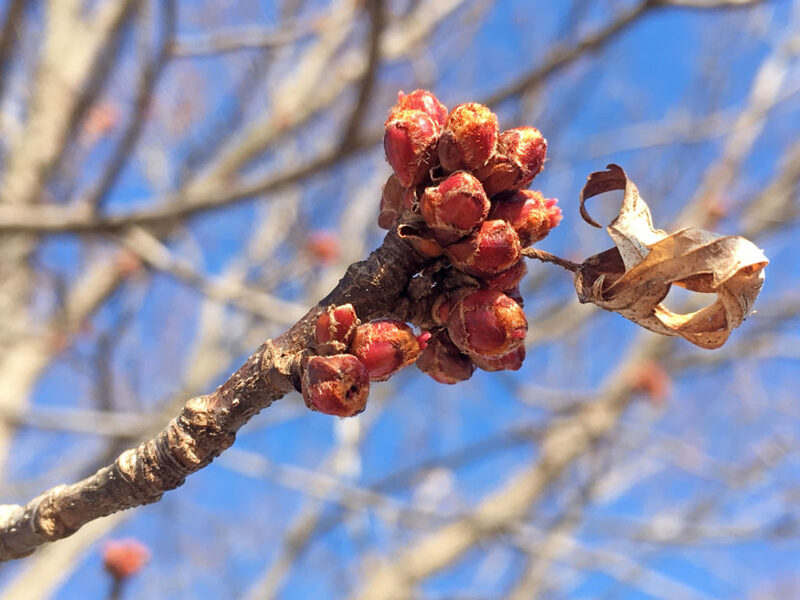 Silver maple (Acer saccharinum) flower buds (Feb. 22, 2019) about to burst. As we persevere through the winter months, I am thankful February only has 28 days. This short month seems to go on and on. If we could get past February, then spring is right around the corner. I know there is still plenty of winter left, but by March, things begin to change. Typically, gardens are “one hit wonders”. They excel in spring or early summer, but fade the rest of the year. This is mostly because our gardens are heavily planted with early season bloomers and short on plants with late season interest. 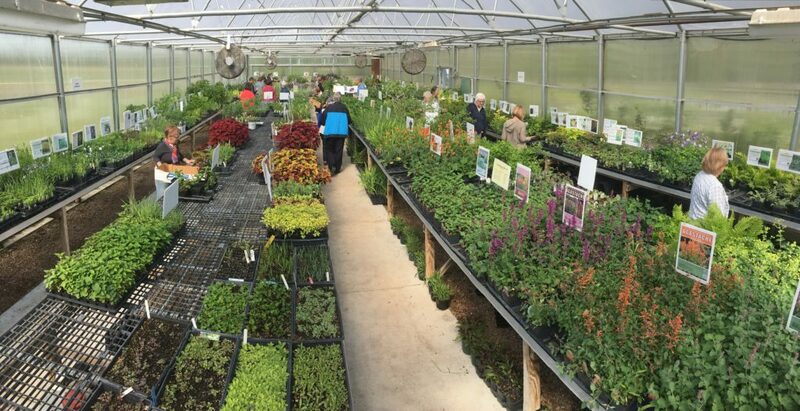 We choose plants to include in our gardens that are blooming in the gardens centers we visit and neglect grasses and late season perennials that are not blooming yet. A four-season garden incorporates diverse varieties with staggered bloom times and textural elements. It is natural to first notice the blooms of perennials. We all want wildflowers that look beautiful in bloom and attract a bunch of different pollinators to our gardens. However, with a four-season garden, equal importance needs to be placed on plants as they emerge in spring or after they bloom. 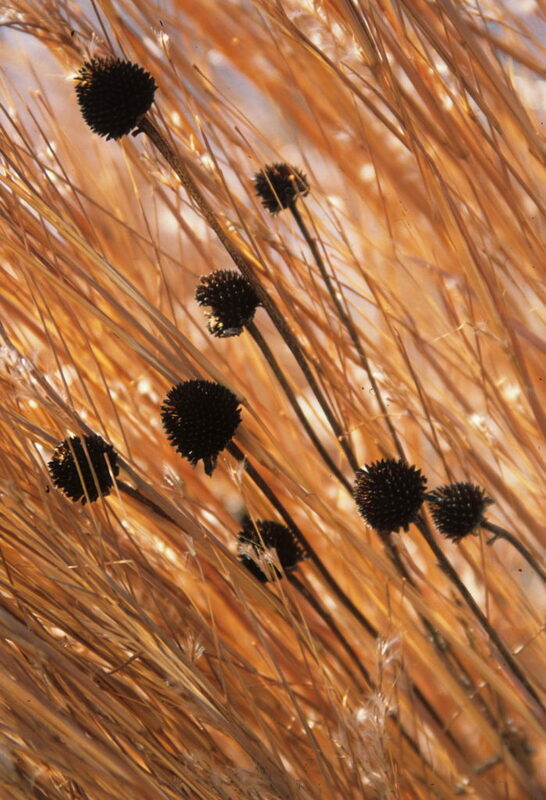 Do these plants have interesting forms, textures, seed heads and architecture that can be highlighted or emphasized? 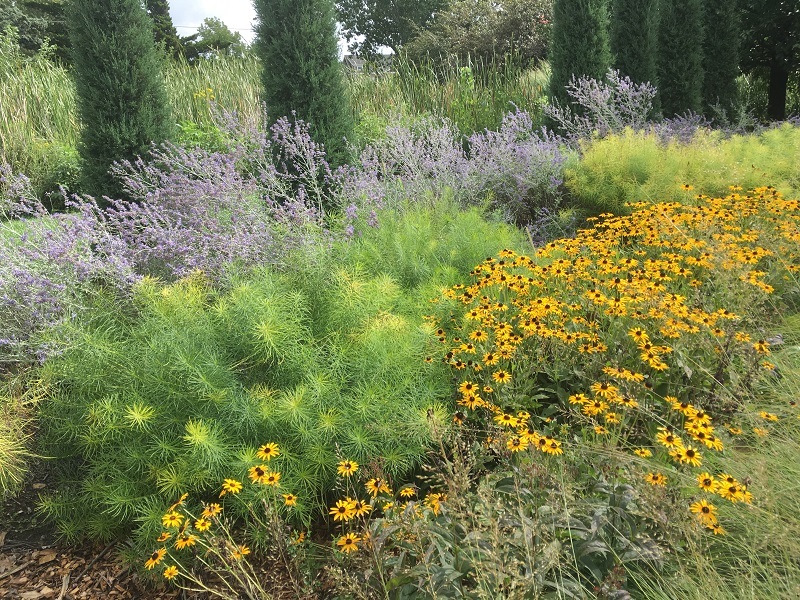 The secret to achieving a four-season border is selecting plants that continue to provide an attractive overall shape both before and after flowering. Plants live in communities. Within these natural communities, all the gaps are filled, from floor to canopy. 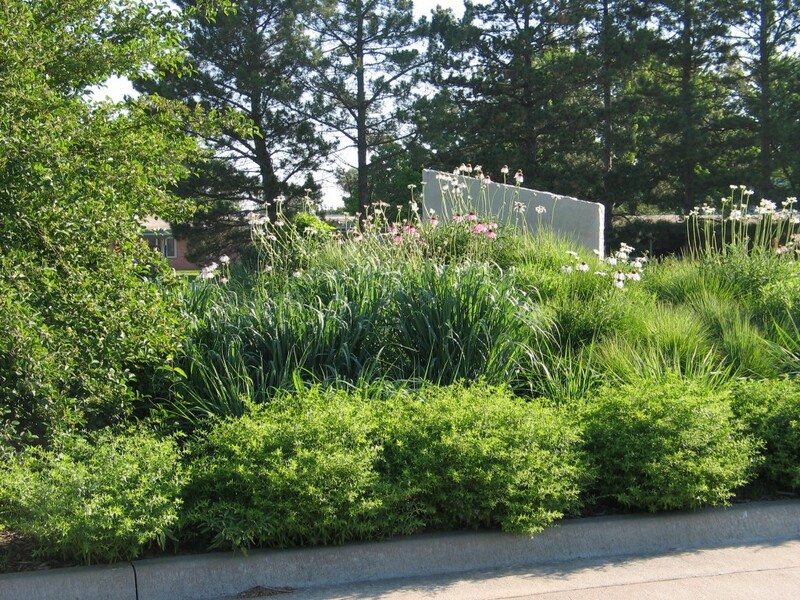 Ground covers intertwine around larger perennials, which grow up to the under story trees and shrubs. Generally, taller trees provide the backdrop to your gardens, but the layered effect can be achieved with wildflowers, grasses and a few strategically placed shrubs. 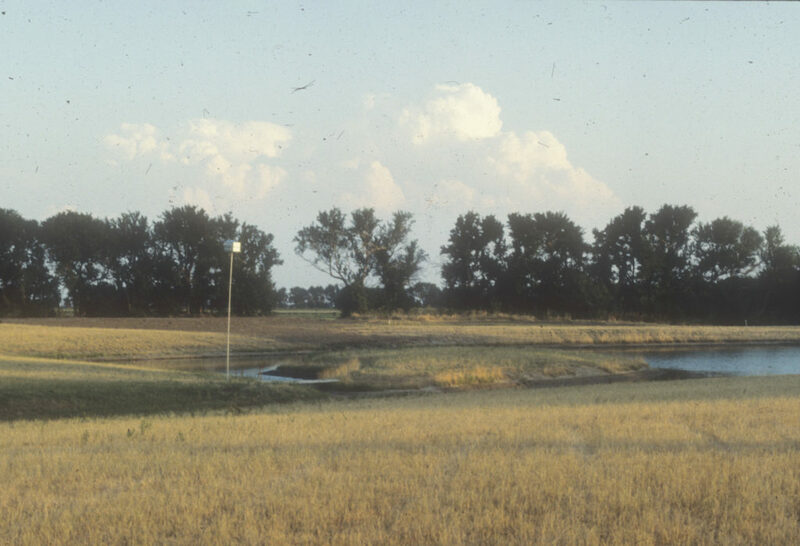 Planting in layers mimics the densely planted prairies or savannas we admire. Layering plants with differing heights, textures, forms, architecture and bark is attractive any season of the year. It takes time to learn what plants grow best in your landscape. Make a conscious effort to see the gaps in your garden. Plan to add elements that provide interest at times in the year that are weaker or sparser than desired. As always, match plants to your site conditions. Many plants have multiple seasons of interest besides when they are in bloom. Learn how to incorporate these perennials. Each season has a unique beauty. Winter is often overlooked but the different hues of brown along with textural elements and architecture add interest to the landscape. 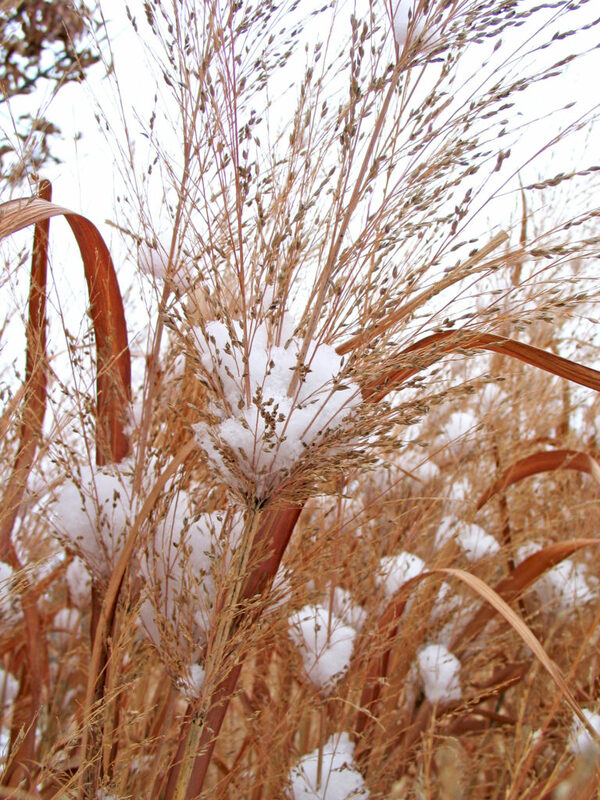 These subtle foliar elements are great as they move with the wind or capture snow that falls. A few focal points that stand out in the stark winter landscape can make a difference in completing your four-season garden. Winter can seem long, but that doesn’t mean you cannot enjoy your garden. Four seasons of interest and beauty can be just a few additional plants away. I love to see the birds eating the seeds from the wildflowers outside my window. The grasses moving with the wind are nice, too. I know spring is coming, but for now, I appreciate what I see. As a horticulturist and a dog lover, life can be a little ‘ruff’. I dream of a beautiful, lush landscape of gorgeous plants and well-tended lawn, but we all know how dogs wreak havoc on our outdoor spaces. Even my sweet pooch, well behaved and trained to a T, inadvertently tramples my plants and upends my #gardengoals with every enthusiastic game of frisbee. But there is light at the end of this long, muddy, paw-printed tunnel — with some careful planning, you can love your dog and your yard. 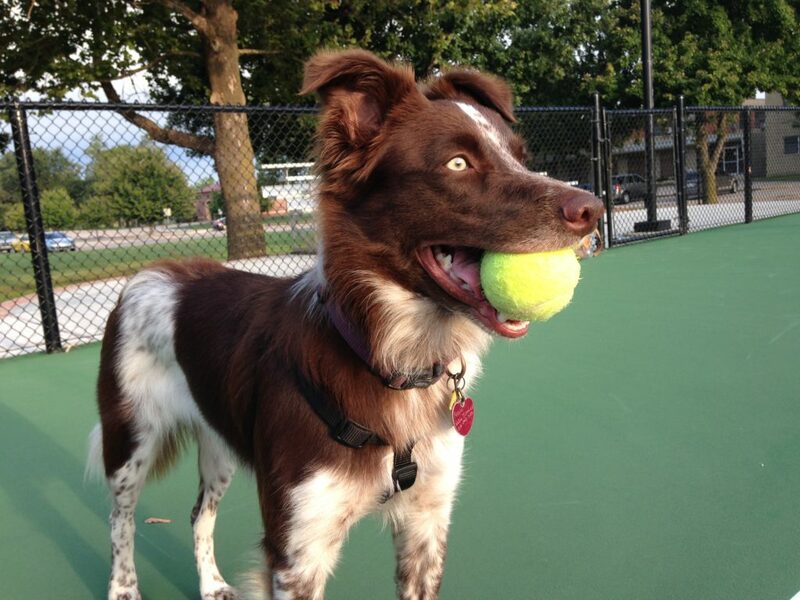 To save my small lawn from total destruction, Rosie and I sometimes take our game of fetch to the tennis courts or a park. This should be a no-brainer, but bears repeating: Keep harmful chemicals and pesticides out of a dog-friendly yard! Even if you think your dog doesn’t “go over there that often”, or you are pretty sure the treatment “will dry by the time she gets there”. Remember that your doggo is in direct paw-to-ground contact with the plants and soil they walk on – not to mention the digging, rolling, and rooting around that pups do on a daily basis. Some studies show a growing link between lawn-care products and cases of canine lymphoma. So, if you or your lawn care professionals are applying ANY pesticides or herbicides, do your research and call your vet to make sure you are making a safe choice for your canine friend. 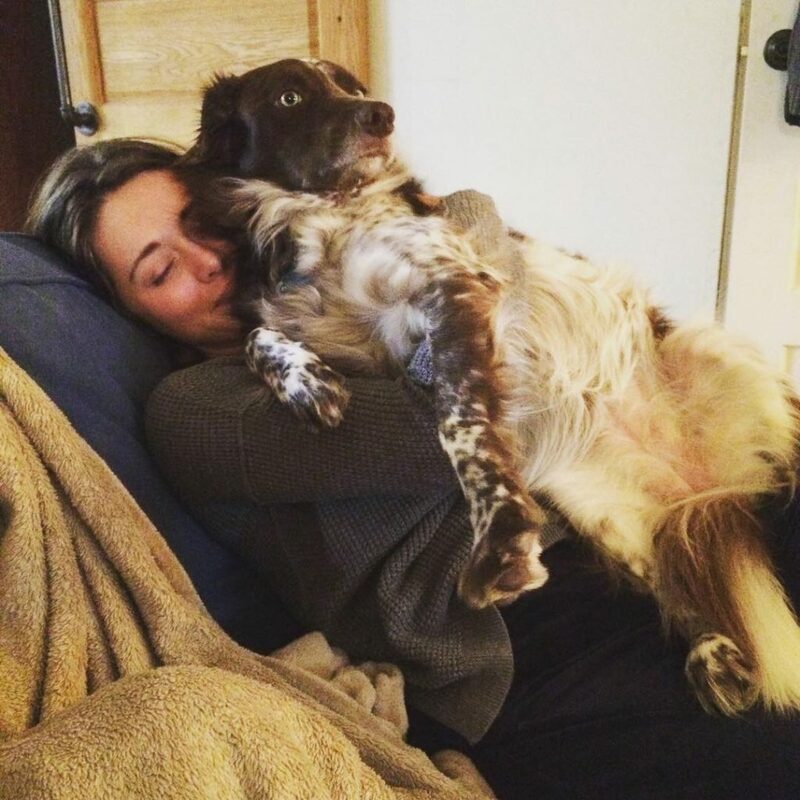 We all love our dogs and smother them in love, and your yard is part of that! Commit a little time to providing a safe and fun space for them! It is impossible to keep straight all the poisonous and non-poisonous plants out there. Even the most well intentioned garden center clerk might get it wrong, putting your pup at risk. Check before you buy at ASPCA.org’s Poisonous Plants database. Be aware that even the most benign plants can cause problems if ingested in large quantities or if your pup has other health issues. On the whole, plants in the mint genus (Mentha) seem to be fairly safe for dogs, including peppermint and spearmint, (but excluding Mentha pulegium.) In fact, many common herbs are safe for dogs and keep their highly evolved noses stimulated. Look for lavender, basil, rosemary, and oregano to include in your garden. Not only will these herbs freshen your pet’s breath should they choose to take a nibble, but they also attract pollinators and have lovely foliage. As much as I love milkweed, this plant DOES NOT belong in a pet-friendly garden. Milkweed has toxic sap with cardiac glycosides in it. Keep all milkweed species far away from your pup’s nibbling snout. As native plants go, it gets a little more difficult to pin down exactly what is safe and what is not. Most native plants only have a toxicity rating for livestock, but with completely different digestive systems, does that rating apply to dogs as well? There are lots of online sources for toxic plant information, so all I can provide here is a short list of native and adaptable plants that DO NOT appear on those toxic plant lists and DO appear at our spring sale. Be sure to check with your veterinarian before assuming the safety of any plant, especially if your pet is prone to grazing. 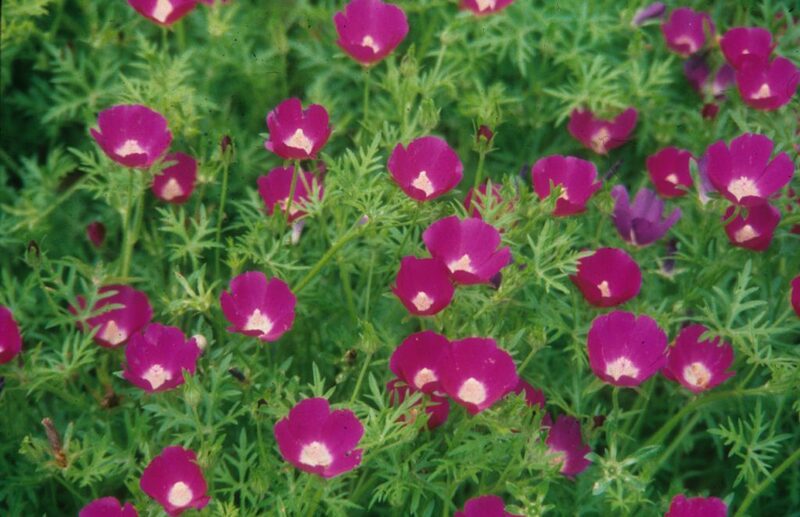 Winecups (Callirhoe involucrata) make an excellent ground cover. They love hot sun and dry conditions. 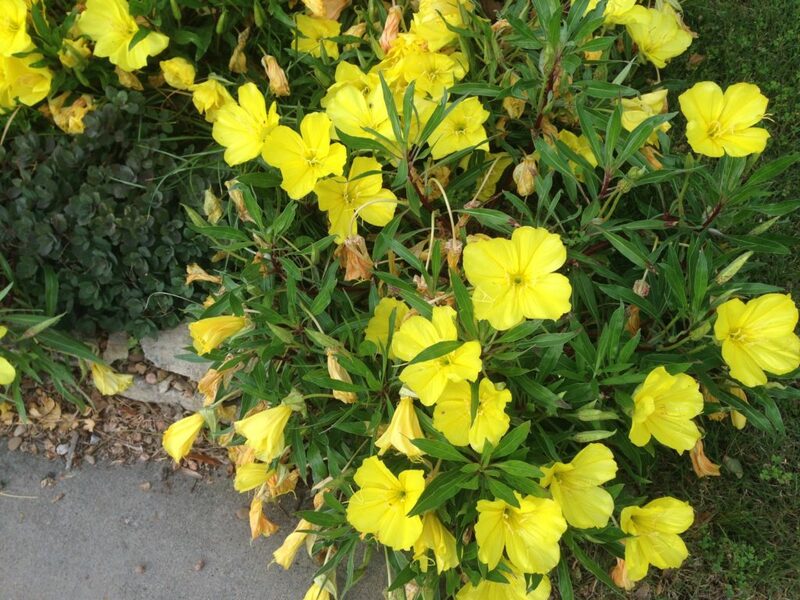 Oenothera doesn’t show up on many toxic plant lists. 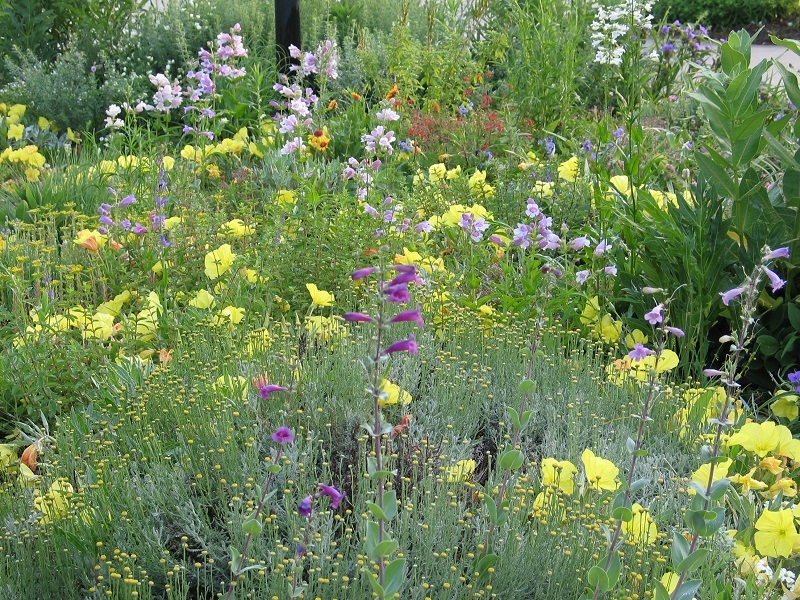 Its large cheery blooms and drought tolerance make it perfect for xeric gardens. If your dog spends unsupervised time in the yard, you have surely found narrow, hard-packed trails devoid of vegetation. These are a dog’s version of cattle trails — a safe and quick way to get from A to B. Dogs are creatures of habit, and this one may stem from their wolf ancestors. Pro tip: DO NOT try to change the trail. It is extremely unlikely you will change his walking pattern; this deeply ingrained behavior is stronger than your desire for a perfect lawn. If you plant anything in this path your pup will tromp over it or dig it out of the way. Instead, think about hardscaping problem areas with pavers, gravel, or a charming boardwalk. A friend of mine has four huge Labradors (yes, you read that correctly) and still manages a stunningly beautiful landscape. How? By planting and planning in accordance with their flow of traffic. 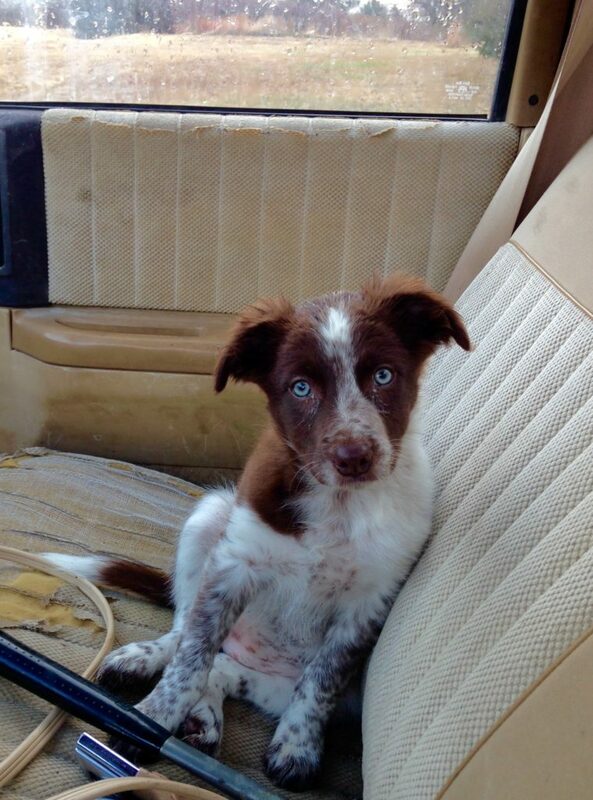 As a young pup Rosie often came to work with me. Here she is staying cozy in our trusty Arboretum work truck. With some careful planning, your backyard can be an oasis for dogs and people alike. If you are needing a little help planning out your garden space, please call us to set up a landscape consultation. 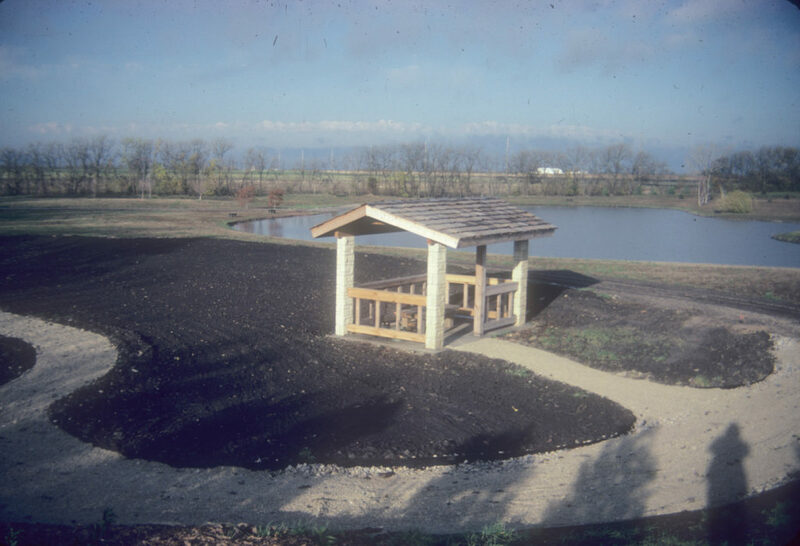 If you would like to get Fido out of the yard for a while, visit the Arboretum grounds for a long walk in the prairie. Be sure to have your pup on a leash and to clean up after her! Our grounds are open dawn to dusk, 365 days per year. Over the past few weeks, I have been doing some cleaning in my office. It is a New Year’s resolution of sorts, but definitely needed. I had mountains of papers that had not been looked through in quite some time. Some of it was worth keeping, but most of it needed to be tossed. Through this purging, I was again reminded of how far the Arboretum has come. Committee meeting notes, board meeting agendas, programming ideas, fundraising updates and past newsletters made for interesting reading about the Arboretum’s past and reminded me how it has continued to grow through the years. 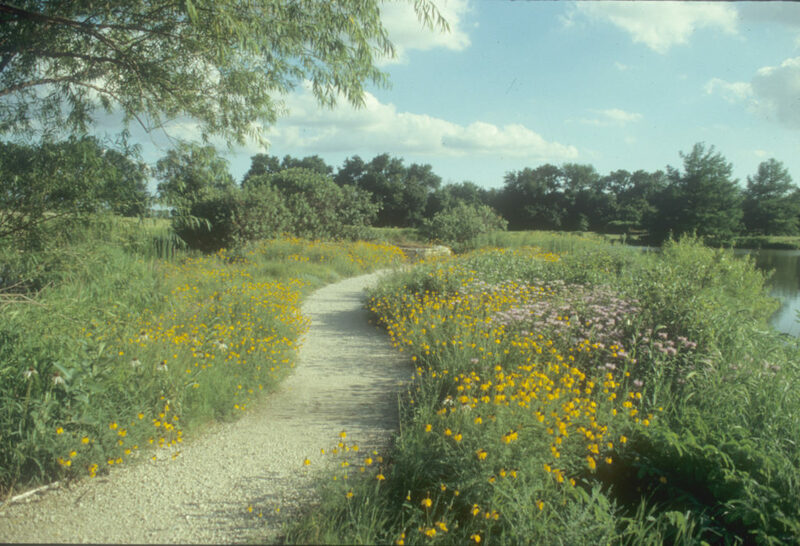 Harold and Evie Dyck wanted a place that reflected the Kansas landscape – a prairie garden with gently rolling hills, walking trails, native plant displays for people to enjoy and stopping points along the way for quiet reflection. 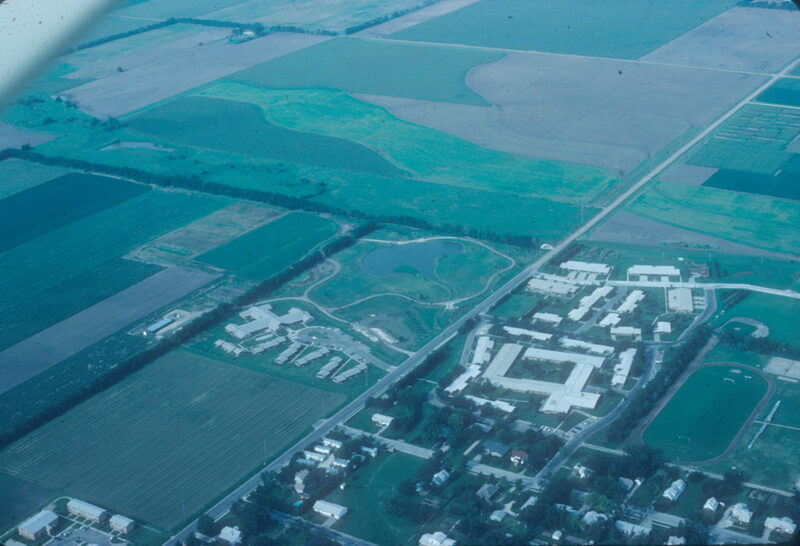 The early mission statement: “The Dyck Arboretum of the Plains exists to foster an appreciation of the natural beauty of Kansas” , focused the development of the grounds and educational programs. 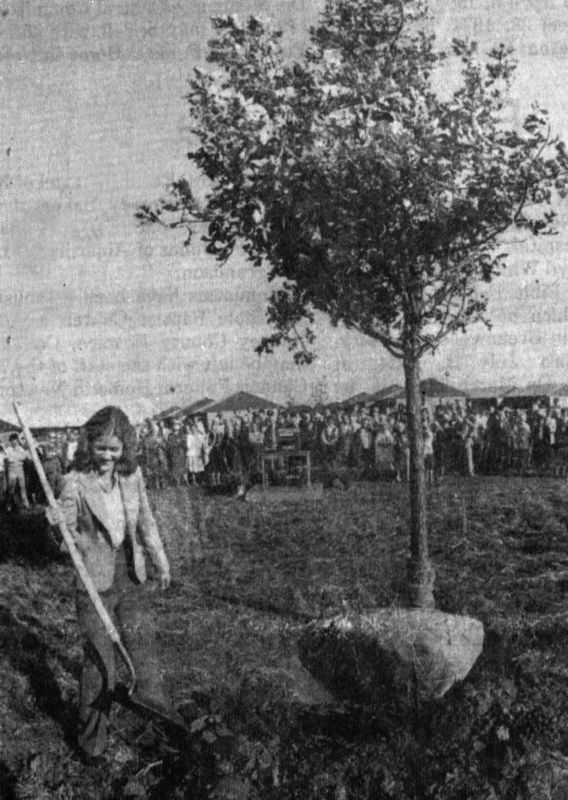 Steady progress was made in the first few decades after the first tree was planted in 1981. 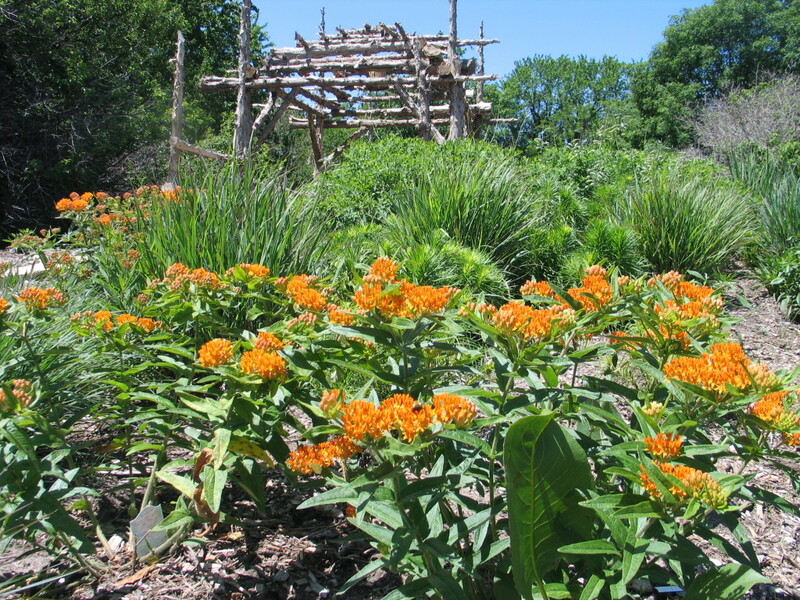 “The Dyck Arboretum of the Plains cultivates transformative relationships between people and the land”. Today, this mission not only refocuses our work on the interconnectedness of people and the land, but also recognizes that the bond we share with plants, animals, water and soil are constantly forming and transforming. Whether caring for our own garden patch or visiting the awe-inspiring tallgrass prairie of the Flint Hills, being in nature changes us. 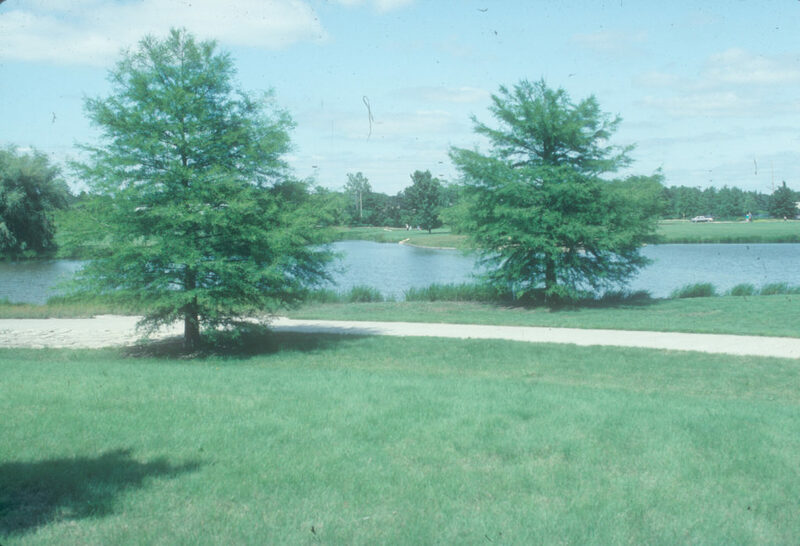 I believe Harold and Evie would be amazed at how far the Arboretum has come since those humble beginnings. 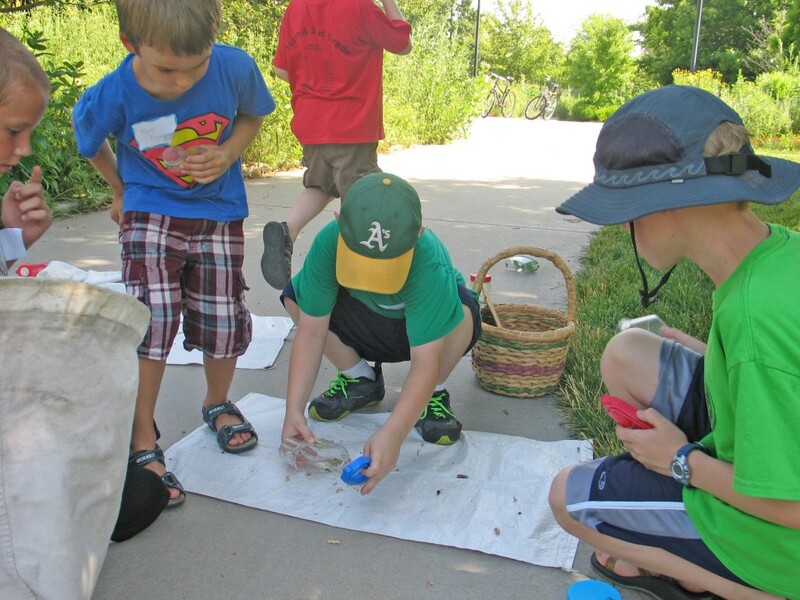 With the Visitor Center, Prairie Pavilion, and the new Prairie Discovery Lab, the Arboretum is able to reach even more people interested in learning about Kansas’ prairie landscape. 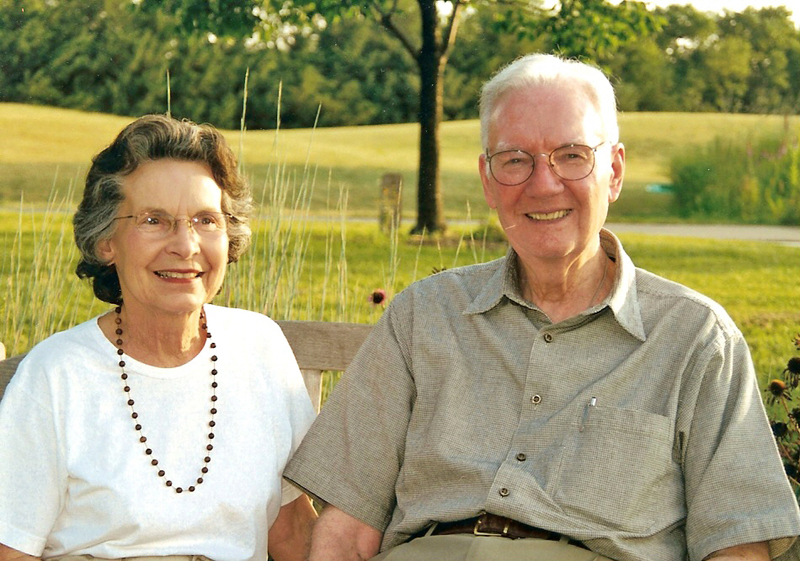 We are so grateful for their dedication to that original vision for this garden. 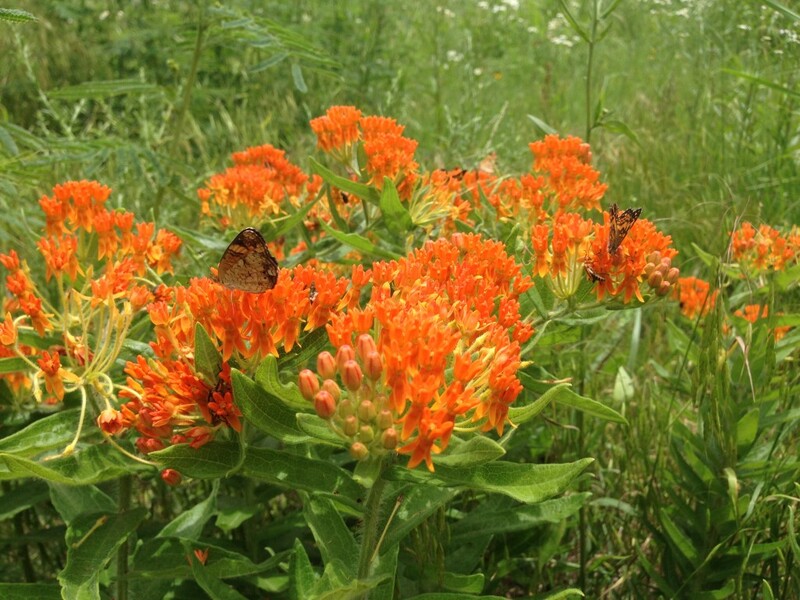 An increasing number of people now see the importance of protecting the prairie. Like Harold and Evie, they seek to understand, have empathy for, and connect with this unique landscape on a very personal level. Their vision seems to have come full circle.